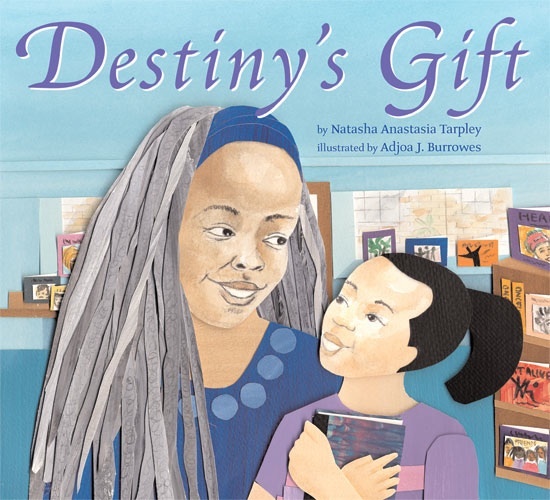 At the age of seven, Natasha Anastasia Tarpley began to write alongside her aspiring writer-mother. While a sophomore in high school, the Chicago native began to gather publication credits for her poetry. At Harvard University, Tarpley enrolled in her first writing workshop…long after a love of the written word was already in her blood. As a result of experiences she underwent while matriculating, Tarpley changed her major from German (which she had studied since second grade) to African American Studies. It was then that she began to write a series of poems which would later garner two fellowships, including the prestigious National Endowment for the Arts Fellowship. Tarpley published her first book in 1998: a family memoir entitled, Girl in the Mirror: Three Generations of Black Women in Motion (Beacon). The very same year, she published her first, widely acclaimed children’s book, I Love My Hair (Little Brown). A companion book followed (Bippity Bop Barbershop, Little Brown), along with two more picture books (Joe-Joe’s First Flight, A A Knopf; and Destiny’s Gift, Lee and Low). Tarpley’s most recent work is based on the historic Disney-animated film, The Princess and the Frog. It’s called, Princess Tiana and the Royal Ball (Disney Press). 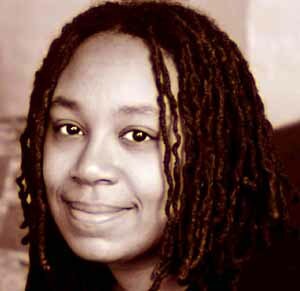 Without further ado, day five’s featured author—Natasha Tarpley. BBS: Natasha, welcome to The Brown Bookshelf. NT: Thank you for inviting me. BBS: You began your writing career with adult-oriented books that were analytical and introspective in nature. What made you decide to start writing for children? NT: I have always approached my writing with a sense of openness, so the stories come as they come. I h ad an idea for a story about a little girl and her mother combing the little girl’s hair every night–based on my own hair-combing ritual with my mom, and that became I Love my Hair!, my first children’s book. BBS: I Love My Hair was the first picture book that you published. Was it the first one you wrote? NT: Yes, it was the first children’s book that I wrote. BBS: In the span of two years, you published three more picture books: Bippity Bop Barbershop, Joe-Joe’s First Flight, and Destiny’s Gift. As an already published author, was it easier to sell these next three? NT: Yes, it was a little easier. 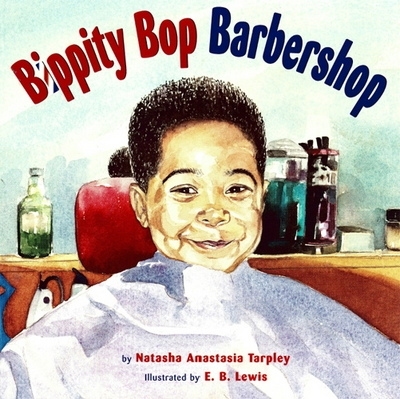 For Bippity Bop Barbershop, the publisher asked me to write a companion book to I Love My Hair, based on the success of that book. The others were not immediately accepted by the first publishers my agent sent them to, but because I had published before, it was easier to get editors to read the new manuscripts. BBS: Your latest book is based on the newest Disney-animated film, The Princess and the Frog. It’s called, Princess Tiana and the Royal Ball. How did your relationship with Disney and this book come to be? NT: I always tell young writers, “Be open and creative in the way that you approach your work. And don’t be afraid to approach people with ideas for projects.” With Disney, I had been following the story of how African American parents were petitioning Disney to create an African American Princess. I knew that once Disney made a film, there would also be a book—and I wanted to write it! So I met an editor at Disney, who introduced me to the editor who would be working on the Princess book. I established a connection with her, and she asked me to write the book when it was time. BBS: Did you get to screen the movie before writing the book? If not, how did the publisher communicate the necessary character and setting details to you? NT: I was able to read the screenplay. BBS: Was it a more or less challenging process to write Princess Tiana, compared to your other PBs? NT: It was still challenging because I had to work with characters and situations that had already been established, and at the same time, be creative. BBS: Back in 1994, you received a National Endowment for the Arts Fellowship, as well as a fellowship from the Massachusetts Cultural Council, for a collection of first person narrative poems you wrote. Could you first describe the nature of these poems, then recount the chain of events that resulted in your competing for–and winning–this prestigious award? NT: When I got to Harvard, I really wanted to explore African American history and identity in a deeper way than what was being taught in my Afro-Am classes. I wanted to try to find a way to get closer to the voices and experiences of my ancestors. So, I started working on a series of first-person narratives that explored these themes. I was required to produce a book-length manuscript for my thesis, and I submitted these poems to the NEA and the Massachusetts Cultural Council. The rest was the universe smiling on me–I was shocked when I won. BBS: What did receiving the NEA Fellowship mean to you…and for your writing career? NT: It was really an affirmation that I was moving in the right direction in my life. And the grant funding enabled me to take time off from school to write—I wrote my book, Girl in the Mirror, during that period. BBS: In addition to writing picture books, you’ve also co-edited an interesting anthology entitled What I Know is Me. Tell us about it. NT: That was a collection of writings by talented young African American girls from around the country, co-edited with a young lady who was 19 at the time. Unfortunately, the book was never released. BBS: You’re an author that goes on school visits, and presents to children regularly. What’s the one question they seem ask you more than any other? BBS: And how do you answer them? NT: I talk about the traditional publishing process of writing a manuscript, and the importance of editing; about how I go through multiple drafts of everything that I write. And then I tell them about submitting to (and working with) agents, versus submitting directly to publishers. From there, I talk about what happens when a publisher decides to accept the book (i.e., contracts, payment of an advance, etc). But these days there are also many alternatives to traditional publishing. Publishing a book yourself is so much easier today. There are websites where you can upload your manuscript and have a book made, or have a book made every time someone buys it. I tell them about these “print on demand” websites, and encourage them to ask their teachers, parents and librarians to help them find these resources…and other kid-friendly websites and publications where they can start to publish their work. BBS: What is the one thing you’ve learned by doing these visits that you didn’t realize before? NT: Kids are really serious about their work—their writing. Educators and parents need to encourage them and to create spaces for them to publish and learn more about their craft. BBS: The seeds of your writing career were planted early, simply by your observing your mother use writing as a means of self-expression and establishing goals. How necessary is it for parents to model the importance of reading and writing to their kids? What are some practical ways they can do this? NT: Parents and teachers and others basically introduce kids to books, and help to shape what their relationship to books and reading (and writing) will be. My mom and dad always read to us, we had a regular story hour at school. These rituals, these stories really make a difference. I remember the books my parents read, the way they read them. I remember the smells, the sounds of libraries. These things are part of who I am. And even if kids don’t become writers, I believe books open doorways and windows that allow them to glimpse the possibilities of the world and who they might become. So, in short, I think it is VERY important for parents and educators to model and reinforce the importance of reading and writing-and also the pleasures of these things. BBS: What’s the one piece of advice you have for newbie writers—that they likely haven’t heard before? NT: Be open and creative in your approach to your work. If you’re a poet, be a poet, but be open to the many ways of being a poet in the world. And don’t be afraid to try things outside of how you’ve defined your work. BBS: What new children’s book projects are you working on? NT: I’m working on a few middle-grade and young adult novels. BBS: I know all of your work has special meaning to you. But if you had to choose just one, which book or project would you say is closest to your heart? NT: I don’t know. Maybe I Love My Hair, because it was inspired by my relationship with my mom, who is my best friend. BBS: Thanks so much, Natasha, for visiting with us today! Before you leave us…Airplanes or Trains? BBS: Movies in the theater, or DVDs? BBS: Peach cobbler or beignets? See, now, pretty much EVERY interview should end with the important question about cobbler vs. beignets. That’s crucial information, there. I also love that Ms. Tarpley has written TWO books about hair! Writing for Disney must have been quite a challenge – I look forward to picking up the new Princess book, and know it will be just as magical as the film. I look forward to getting this book for my little princess. 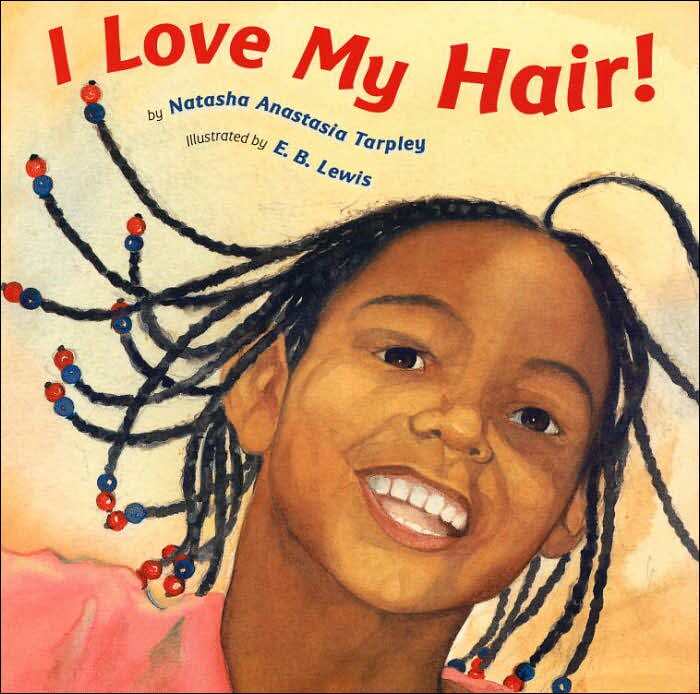 i’m also grateful for ms. tarpley’s books about appreciating your hair! great interview, thanks to you both, and i love the advice for new writers. Bippity Bop Barbership was a favorite of my oldest years ago. It was hard then, as now, to find children’s books featuring African American boys. Great interview! Natasha writes beautiful books. I’ve read I Love My Hair to my daughter many times. And she treasures her copy of Princess Tiana and the Royal Ball. If you haven’t read her other titles, check them out. All wonderful. Thanks, Tameka, for asking great questions. And thanks, Natasha, for your heartfelt answers. Wishing you continued success! LOVED this interview, Tameka! So nice to learn more about Ms. Tarpley and her writing journey! Very INSPIRING! Wonderful interview with a very accomplished author! Great interview. I hope my library has “I love my hair”. I’d love to read this with my daughters. Thanks so much for a great post with a lovely author! 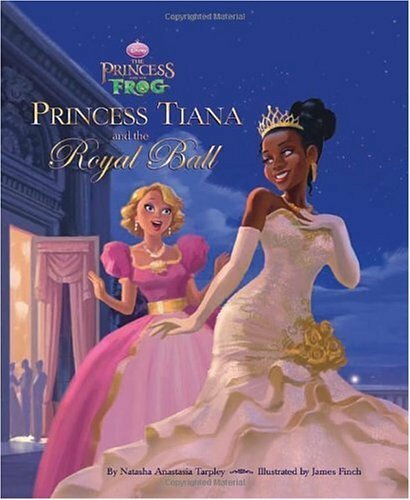 I love the book I love my hair and Princess Tiana and the royal ball. I love those books because it shows me I can have different hairstyles. Princess Tiana showed me that everyone makes mistakes all the time. MY NAME is amaya and i love your books! Pingback: I love my hair! | Mistikrak!